It’s that time of year when everyone stops, looks around and exclaims, ‘Woah, it’s mid-November already?!’. In Japan, the passing of the year is marked in a much more beautiful fashion. Winter light festivals are a symphony of tiny, coloured bulbs which start as early as late October and last all the way through till spring, bringing a twinkling magic to the cold winter nights. Close to the city of Kuwana, which is inbetween Kyoto and Tokyo, Nabana No Sato is a botanical theme park. Throughout the year it is a place of meticulously landscaped gardens and greenhouses full of fragrant flowers but when autumn rolls around it turns into a fairytale land of lights! Running from late October to mid-March annually, the theme for the lights changes on a yearly basis; in the past there’s been Mount Fuji, Niagara Falls and the beauty of Mother Nature. 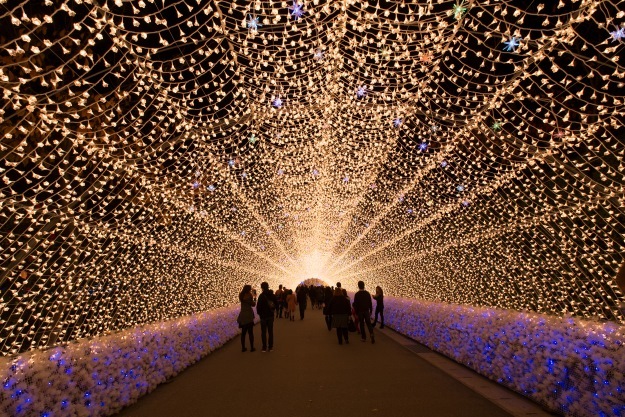 The centrepiece though is the enchanting Tunnel of Lights, a 200 metre stretch of millions of LED lights for visitors to stroll through. What makes it even better is the fact that the lights are solar-powered, so the whole display is environmentally-friendly. Lighting up Kobe for just over a week in December (it’s running from 8th to 17th Dec in 2017), the Luminarie started as a commemoration for the victims of the Great Hanshin Earthquake in 1995. Although it was supposed to be a one-off event it was so popular that it is still going strong 21 years later, and continues to symbolise the hope that it inspired in the people coping with the earthquake’s destruction. The lights were donated by the Italian Government and every year over 200,000 hand painted bulbs are used, powered by biomass electricity. 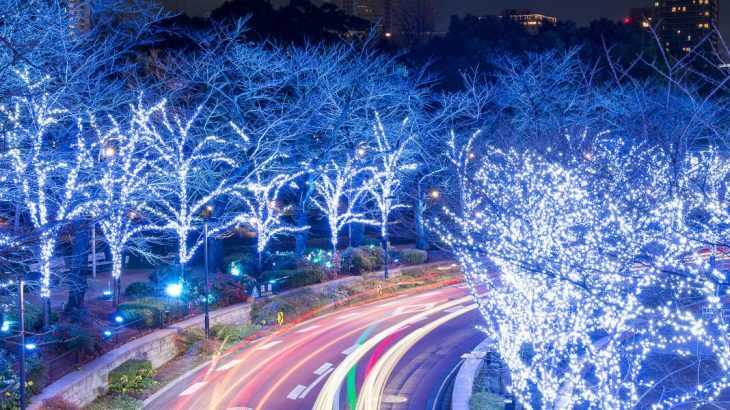 From mid-November to mid-February, the Caretta Mall in Tokyo’s Shiodome puts on one of the best light displays in the city, which is quite a feat! Using over 250,000 LEDs, the display blazes to life every 20 minutes throughout the winter evenings in a mesmerising display. The 2017/2018 theme is Beauty and the Beast. 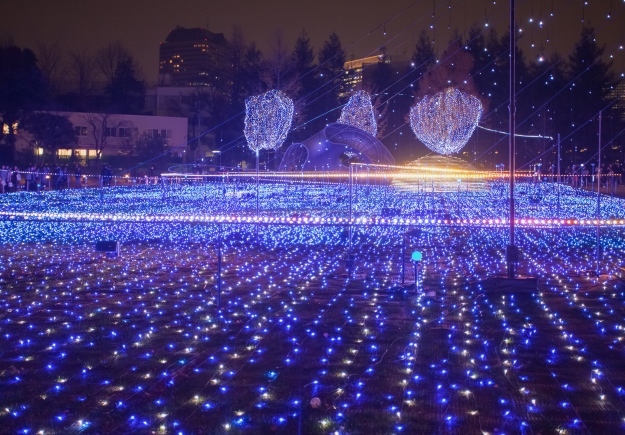 In its 10th year of bringing joy, the illuminations of Tokyo Midtown are so impressive it’s quite common to see couples camped out with champagne in the evenings to spend time admiring them! The Starlight Garden is the pièce-de-resistance – an outdoor park by day, at night it is filled with the light of 280,000 digitally controlled LEDs. This display is lit up from 15th November until Christmas Day, so you can expect a wonderfully festival atmosphere. 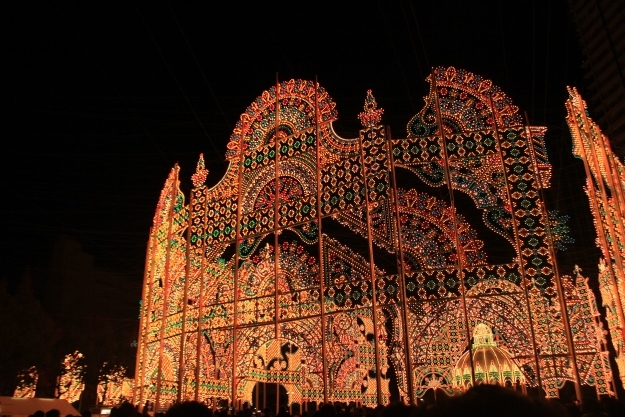 Between November and April every year, the Kingdom of Light takes over Nagasaki’s Dutch theme park Huis Ten Bosch. With a colossal 10 million bulbs used to create magnificent themed displays (last year there was a light dragon), make sure you check out the Art Garden of Light for something truly spectacular. Another magical feature is the illuminated canal, lit with underwater lighting that goes hyper-rainbow as a boat passes through. Book an escorted tour of Japan with the UK’s leading Asia Experts, Wendy Wu Tours. Our fully inclusive tours visit all the major sights of Japan for an unforgettable holiday. Japan festivals, japan news, top things to see, winter. permalink.